Alkaline Water stock has surged following a move into CBD water. That better pay off, as its operating results don't come close to justifying the current share price. Given the stream of common stock dilution, this looks like an easy pass for most investors. Our company offers retail consumers bottled alkaline water in 500-milliliter, 700-milliliter, 1-liter, 1.5 -liter, 3-liter and 1-gallon sizes under the trade name Alkaline88®. Our product is produced through an electrolysis process that uses specialized electronic cells coated with a variety of rare earth minerals to produce our 8.8 pH drinking water without the use of any chemicals. Our product also incorporates 84 trace minerals from Himalayan salt. Our product was designed to have a clean smooth taste using only purified water and the Himalayan salt. Consumers drink our water because of the taste profile and the perceived health benefits. We are now one of the largest (by sales volume) alkaline water companies in the United States. The company may be among the largest alkaline water players out there, but that's because it is a very small market. Alkaline Water reported sales of $3.1 million in November - its highest in its corporate history - which amounts to just $37 million annually. The next Dasani, this does not appear to be. Health benefits of alkaline water are not guaranteed and have not been proven. There is a consumer perception that drinking alkaline water has beneficial health effects. Consequently, negative changes in consumers' perception of the benefits of alkaline water or negative publicity surrounding alkaline water may result in loss of market share or potential market share and hence loss of your investment. Color me skeptical that this is going to be a huge market, though I've been wrong on consumer health and wellness trends before. The CEO suggested in a recent interview that many celebrities including Tom Brady are using alkaline diets at the moment and that alkaline waters can play a role in that. You never know, this sort of trend could take off. 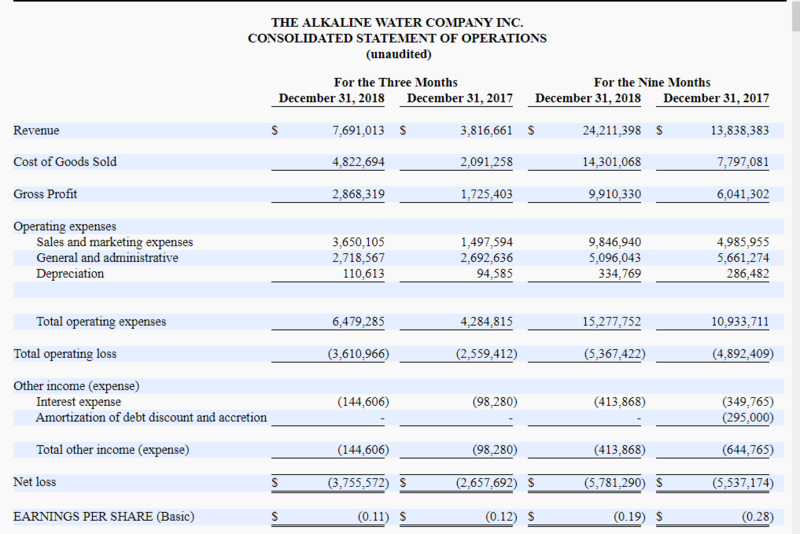 It's worth noting that Alkaline Water stock has operated for years in its traditional water business and seen shares trade for around $1-2 each. The market wasn't excited for Alkaline Water when it was simply a money-losing bottled water play. As such, time to enter the CBD space. In that same interview linked above, the CEO suggested that the company is moving into CBD/hemp waters. 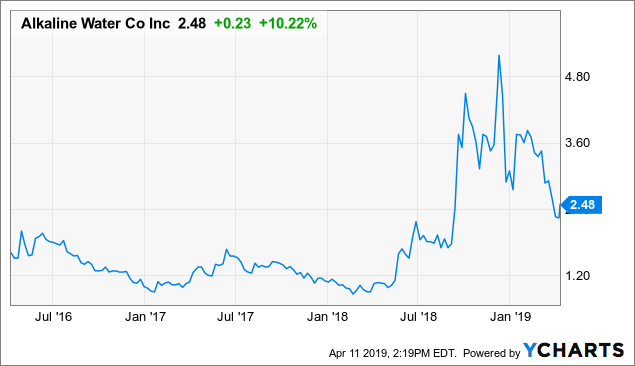 The CEO suggested that this could be a $22 billion market and that its retail partners have been urging Alkaline Water to get into the space. The CEO says that the company is using a hemp extract rather than an isolate to obtain better taste and avoid the sort of oily residue that appears in other marijuana beverages. "It actually tastes great," the CEO says about the company's CBD water, which could be a big bonus given the mixed reviews of other CBD beverages so far. Whether this will actually amount to much in the way of revenues anytime soon remains to be seen. As we've seen with other small beverage companies, such as New Age Beverages (NBEV), the time between when a stock flies on marijuana rumors and when marijuana-based beverage revenues get going can drag on longer than expected. We're still in the early days of cannabis as an investable industry and most stocks heading into the arena won't be big winners over the long haul. In a really interesting turn of events, for the most recent quarter, revenues doubled from $3.8 million to $7.7 million. However, cost of goods sold rose by more than 130% from $2.1 million to $4.8 million. Presumably, as operations scale up, margins should go up, not down. Alas, as gross margin fell, other costs soared. Sales and marketing, in particular, jumped by almost 150%. Spending an extra $2.2 million in sales and marketing to generate an additional $3.9 million in revenues is not particularly effective ad spend. In any case, net loss widened by $1.1 million for the quarter, with EPS only looking better due to additional share dilution. Speaking of share dilution, the number of shares outstanding has more than doubled since the beginning of 2016. And even that was before Alkaline Water's latest proposed stock offering in March. Given that the company is losing millions of dollars a year in operations and will likely need more capital if the CBD water business is to get going, I'm not surprised they are raising capital. But it puts WTER stockholders in an even more undesirable position, given that the company is already trading near 3x sales for an operation that loses tons of money. Alkaline Water, as a product category, could certainly catch on. Particularly, if you get enough celebrities on board, perhaps the public will love this trend despite the lack of proven health benefits. And as for marijuana stocks, they are volatile and can do anything in the short run. For longer-term investors, however, I'd stay clear of Alkaline Water. The company's product seems overpriced and not likely to meet a major consumer need. 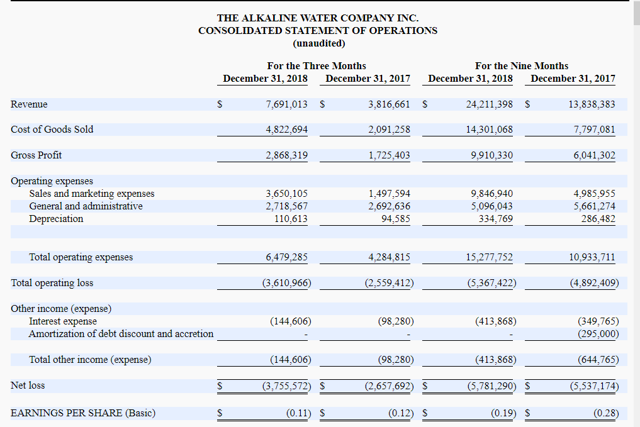 Given its sales and marketing budget, it seems Alkaline Water is struggling to generate revenues without major promotion. Perhaps a move into CBD water can fix that, but until I see stronger profit margins coming from the business, this looks like a clear avoid. Particularly, with so much stock dilution to keep operations going, WTER stock is likely to keep trading lower and lower over time unless the company's business momentum really picks up. If you enjoyed this, consider subscribing to Ian's Insider Corner to enjoy access to in-depth reports for all the new stocks that we buy. Membership also includes an active chat room, weekly updates, and my responses to your questions.